Limited edition Midtown Atlanta swag is here. Midtown is a place where community spirit burns bright. You can feel it on the tree-lined sidewalks and under the colorful street banners. Our neighborhood’s good vibes are even reflected in storefront windows. It’s the ultimate warm fuzzy. And now you can show your Midtown pride in a fun, new way. Snazzy Midtown winter scarves and socks. Because there’s more to explore on foot. Walkability rules in Midtown. So much care and investment goes into making a great experience every day for people walking. What could be more fun than brightly colored woven scarf or a pair of comfy socks to express your walking lifestyle? The best part is that your purchase supports local businesses, and 1% of sales gets reinvested in sidewalk improvements. Available now at select local shops around the district … while supplies last. Buy it. Rep it. Share it. We love that you love our brand - and we want to make sure you get some love too! Whether you're rocking the MidtownATL scarf, or walking like a boss in the knit socks, be sure to share it on social media with the hashtag #MidtownATL to be featured on our website and social media pages. 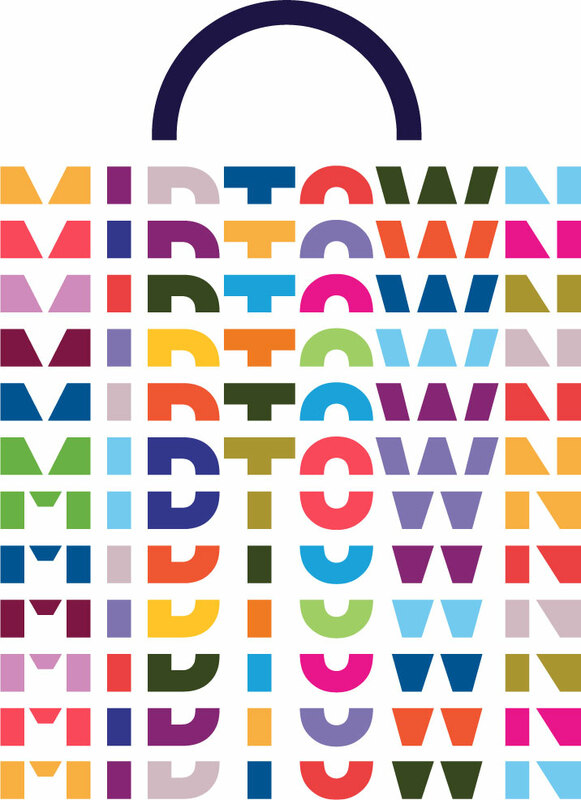 Midtown Alliance worked with uber-talented ATLiens Sarah Lawrence and Tori LaConsay to come up with the designs, incorporating the Midtown Atlanta brand that everybody loves. Domestic companies made the products. And they’re being sold exclusively at local retailers … for YOU. So, win-win-win-win-win. People love the Midtown Atlanta brand and what it stands for: an exceptional urban experience in the heart of our city. We’re bringing three different priorities together by tapping into Midtown Atlanta’s strong sense of community and encouraging more walkability that results in increased store traffic for Midtown retailers. How did we decide which retailers to partner with? We approached a handful of stores that are current Midtown Alliance members specializing in gifts and soft goods, and that are spread geographically across the Midtown commercial business district. The goal for this pilot project is to generate good old fashioned, walk-in store traffic for Midtown retailers. We believe this is an effective strategy to experience Midtown on foot and to get to know more about Midtown’s existing retail options while spending dollars locally. There are no near-term plans to offer online sales. Why don’t we sell them at other stores or more locations? We elected to start small with a pilot effort to see if we can manage the process effectively. If the program proves successful over time, we hope to expand to other stores in Midtown. How do I get scarves or socks if I find they’re sold out? Will you make more? When? This is our first effort at managing merchandise design, production and distribution. We hope the merchandise sells out, because that means the demand is out there. If the program proves manageable, and if participating retailers want to keep offering the products, we’ll make more in the future. Are we going to do other products or designs? A lot depends on how this initial pilot project goes. But we are interested in exploring other branded products that support a walkable Midtown lifestyle, and potentially new designs that represent the Midtown Atlanta brand. I have an idea for a new Midtown Atlanta branded product or a suggestion on a store to sell your products. Who do I share it with?